We’d love your help. 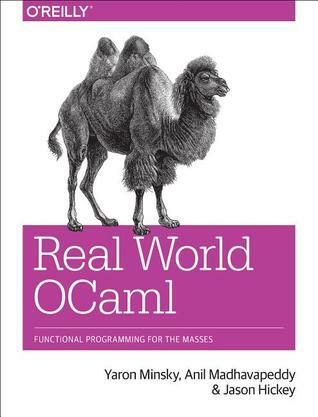 Let us know what’s wrong with this preview of Real World OCaml by Yaron Minsky. Real World OCaml takes you through the concepts of the language at a brisk pace, and then he This fast-moving tutorial introduces you to OCaml, an industrial-strength programming language designed for expressiveness, safety, and speed. Through the book’s many examples, you’ll quickly learn how OCaml stands out as a tool for writing fast, succinct, and readable systems code. Real World OCaml takes you through the concepts of the language at a brisk pace, and then helps you explore the tools and techniques that make OCaml an effective and practical tool. In the book’s third section, you’ll delve deep into the details of the compiler toolchain and OCaml’s simple and efficient runtime system. To ask other readers questions about Real World OCaml, please sign up. Does what it says on the tin — this book focuses on teaching ocaml with lots of code examples that strive to be close to things you'd really do. The first major section discusses the language itself, which is quite thorough, and the second section is about practical patterns, like concurrency and when to use certain data types. The practicality extends to its use of Core, a replacement standard library, instead of trying to teach the language without any dependencies — that's not how you're goin Does what it says on the tin — this book focuses on teaching ocaml with lots of code examples that strive to be close to things you'd really do. The first major section discusses the language itself, which is quite thorough, and the second section is about practical patterns, like concurrency and when to use certain data types. The practicality extends to its use of Core, a replacement standard library, instead of trying to teach the language without any dependencies — that's not how you're going to use it. I might be a bit harsh, but based on all the positive reviews, I've expected much more of the book. What you get is an easy introduction to the OCaml world that touches most of the aspects of software development in OCaml. However, when they approach a more complex topic, the authors just say "there is some magic going on", and they abandon it. For example the SExp library. I'd love to learn how it is implemented and how the compiler extension is developed, but the book does not touch any of that I might be a bit harsh, but based on all the positive reviews, I've expected much more of the book. What you get is an easy introduction to the OCaml world that touches most of the aspects of software development in OCaml. However, when they approach a more complex topic, the authors just say "there is some magic going on", and they abandon it. For example the SExp library. I'd love to learn how it is implemented and how the compiler extension is developed, but the book does not touch any of that, but no, "here's some magic, let's move on". It would also help readability, if the code examples were syntax-highlighted (and if they used proper file names), but that's nothing serious. The book covers the basics like Lists and Patterns, Records, Variants and Error-Handling. But of course it goes beyond with Functors, Objects and Command-Line Parsing...not letting important concepts like JSON handling Concurrent Programming aside. So...it's a pretty complete reference to start out. It was good. My first book on OCaml, it was pragmatic enough to teach you the common gotchas, while also being straightforward and sufficiently organized that it can be used as a reference. A very practical introduction to Ocaml! It is also, at the same time, a good overview of the Ocaml ecosystem and it's theoretical underpinning.